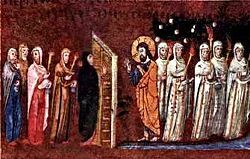 The Parable of the Ten Virgins (Matthew 25:1-13) finds its place in the Passion narrative of Matthew’s gospel. As the storm clouds of Jesus’ coming trial and crucifixion loom and gather, it is a reminder to those following the way of the peace of the Kingdom to remain alert and vigilant. Life and its events have a way of catching us by surprise. When awake and aware, we can savour and appreciate the fullness of what is taking place. We can be wholly present and wholly included in the gifts and graces of the occasion. If we are only half-awake or in a state of boredom, we not only fail to catch what others see, we might miss the boat altogether. The parable is an invitation to savour with our whole being and full range of senses the events of our life, to discern where the Bridegroom is present and calling, to celebrate and not miss out through lack of focus.